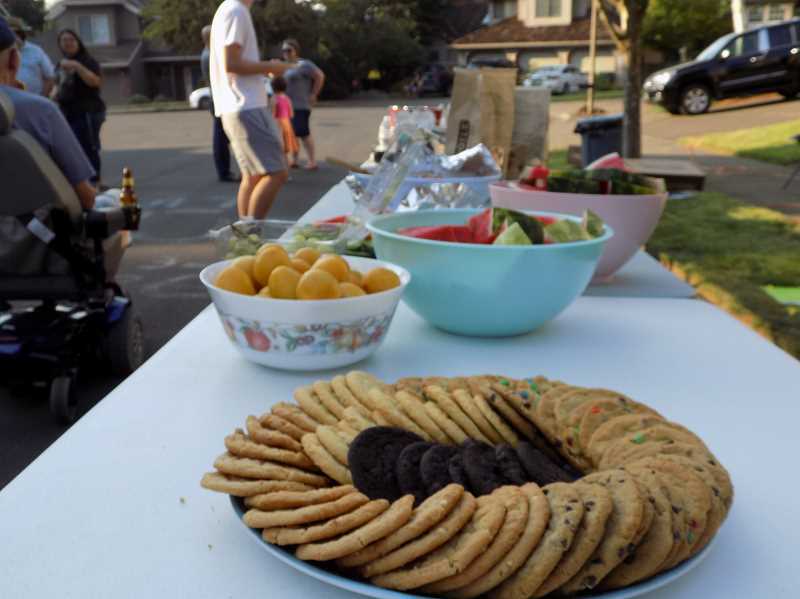 Residents of Tualatin's Jeffwood Estates were more than prepared for their annual National Night Out with a lavish potluck that included everything from donuts to food supplied by Chipotle. The rest of the evening would include appearances from Tualatin Police Department officers, McGruff the Crime Dog and Tualatin Valley Fire and Rescue firefighters aboard an engine. 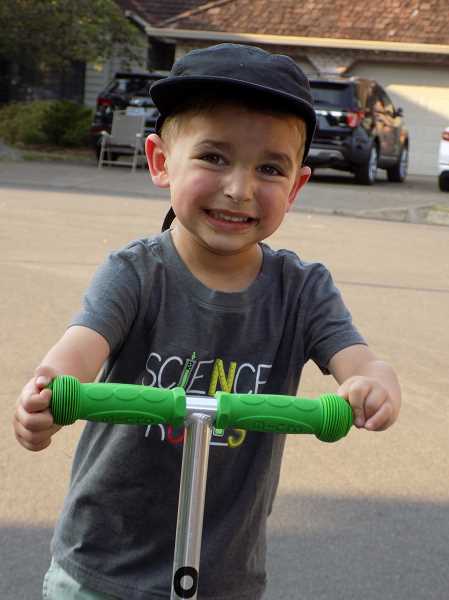 The annual event, which for the last several years has been co-organized by residents Eileen Burdick and Ashley Picerno, was expected to draw anywhere from 50 to 60 neighbors before the night ended. 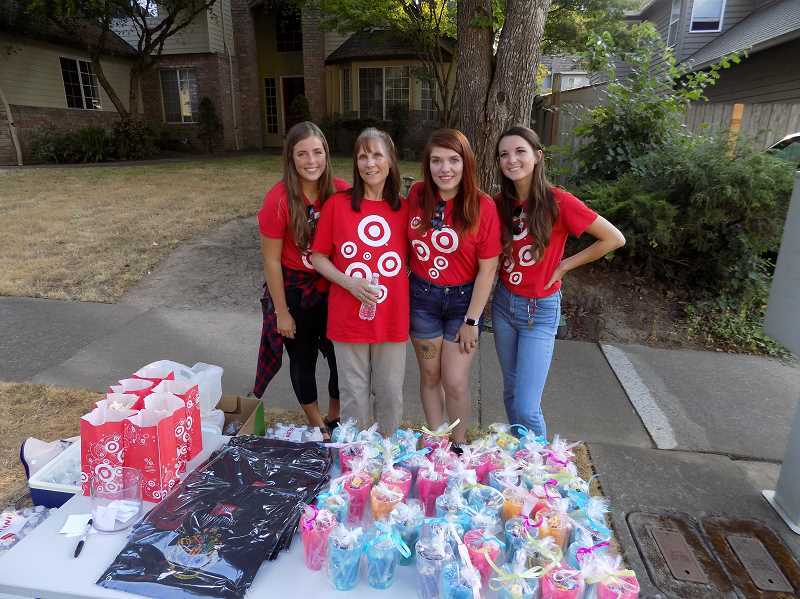 In addition to potluck fare, the Sherwood Target donated bottled water, LEGO drawstring backpacks, free candy cups and popcorn along with several backpacks filled with school supplies slated to be raffled off later in the evening. 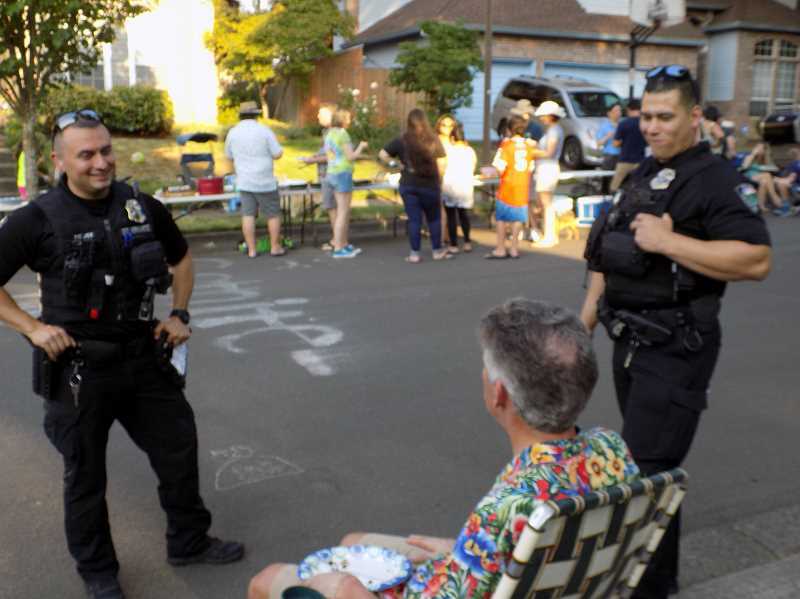 Among those who popped in to say hello to the Jeffwood Estates residents was Tualatin Police Chief Bill Steele, who was warm not only from the mid-90-degree temperatures and his black police uniform but also from playing in an impromptu game of street basketball. Steele had already been to four neighborhood events and had planned to hit a bunch more. Steele said he thinks observing National Night Out is important. "This is a great opportunity for people to come out in their neighborhood and meet each other," he said. Before long, two other Tualatin police officers, Jorge Solache and Daniel Hernandez, showed up and chatted with kids and parents alike. Burdick said she looks forward to yearly gathering and that her neighborhood is focused on staying safe, pointing out they have an active Neighborhood Watch program in effect. Burdick said before the evening was expected to end at 8:30 p.m., plans were to likely take a big group photo as in years past. 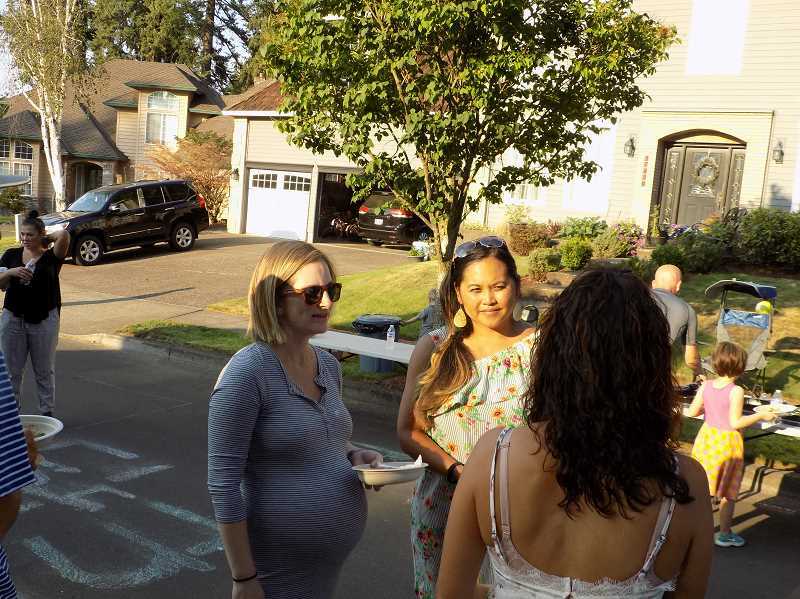 Pierno said she likes visiting with her neighbors as well, noting that they didn't have a similar event when she lived in her former home in East Portland. Munching on some potato chips, Caden Burdick, 10, said he looks forward to National Night Out as well because it gives him a chance to see everybody in the neighborhood.